Have you ever wondered how to pick the right color and wall to feature as an accent wall? We at Walls by Design get this question a lot. In fact, on occasion, customers have us come out to give an estimate only to paint “accent walls.” We have all gone to a model home or seen a home featured in a magazine with a dining room or hallway with a stunning accent wall. The problem is, you are only seeing part of the picture. You may be seeing a well-staged room, but you have to remember you live in your home and you need to think of the space as a whole. Cost can be a driving factor for many people to want accent walls. People want to decorate and have a home that is on trend, but they don’t want to spend thousands and thousands of dollars. Accent walls can be a great addition to a project, but they need to be executed the right way, or they will stand out and feel off. Over the years, several customers have come to us with the typical “builder white” walls: all the ceilings and walls are the same flat color. In this situation, I am often asked to “just paint a few accent walls.” I almost always talk the customer out of this for a few reasons. First, the finished product will look unfinished. The home will look exactly as you have asked, just a few walls painted. It will seem as though you didn’t have the money to paint the entire house. In the model home, all the colors would be designed to work together along with the décor. Adding a few “pops of color” to the old framework will not get you to your intended look. If you don’t believe me, how often have you gone shopping wearing your “normal clothes,” picked up a colorful sweater or scarf you liked, added it to your outfit for a “pop of color,” and it magically just worked? Almost never. Instead, you would construct a whole outfit involving that accessory so everything matched. In order to achieve a finished look, all of the colors and the décor in a space must be considered. By simply choosing to paint a few accent walls, you are ignoring the other walls in your home that likely need attention. Most homes, unless it is brand new, have wear and tear: walls get grimy. My wife and I bought a house two years ago, painted all the walls, and already our upstairs hall looks terrible due to two teenage monsters that inhabit the end of the hall. Unless you and your spouse are empty-nesters or you require your children to wear gloves in the house, your walls will also take a beating on a regular basis. Selecting the right wall to accent. 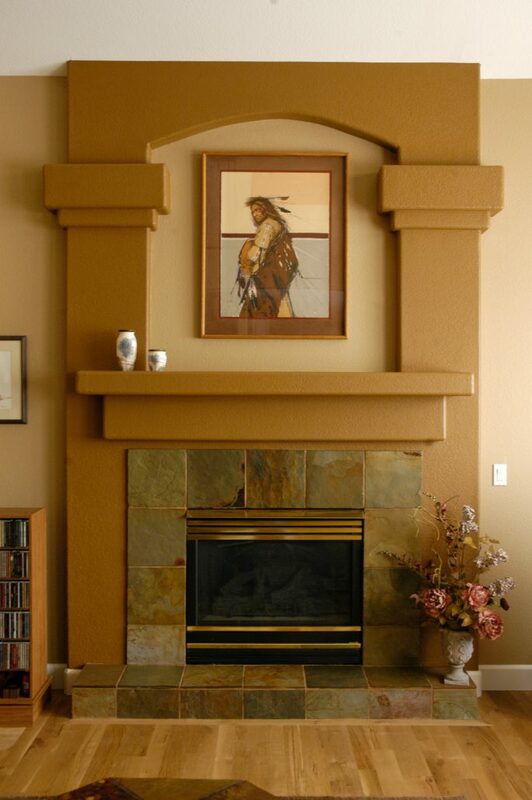 The wall has an architectural detail you want to highlight, like an art niche, a fireplace detail, or special moldings. When you paint an accent wall, you are trying to grab attention. You are saying: “Hey, look at me!” You don’t want friends and guests in your home to then think: “Why am I looking at this wall?” If the wall is odd shaped or just ordinary, you should not accent it. We had a customer insist on painting a HUGE wall that stretched over her kitchen and into her entryway a deep red. I told her not to paint it but she insisted, and boy did it stand out…and not in a good way. I don’t think the customer is always right. Picking the right color for an accent wall. Customers always want to know how to pick the right color for an accent wall. Now I am no color expert, but I have selected a TON of colors for customers over the years. In fact, I used to do all the color selection for our customers and was named one of the best resources for color design in Denver by a major home décor magazine. When selecting an accent color, I look for colors that are already present in the space. For inspiration, I will look at pillows, pictures, rugs, drapes, or bedding. Often times, I recommend a color that would be used in another part of the home for the accent color. For example, the living room and dining room might be one color while the main space or family room is another. I would use the living/dining room color as an accent in the family room. This works well to bring unity and cohesion in the space, without letting it get too busy. One big mistake I often see other “color designers” make is paint an accent color two or three shades off the main color. As a painter, it drives me crazy! You can barely see the color change due to shadows and different light directions. The worst is when we are asked to use one color number off of the main number. You can look straight at the walls and not notice a difference. If you want to accent something, “Go big or go home!” It’s possible some color designers feel the need to select multiple colors (even if there is only a subtle difference) to justify their fees. I like using multiple colors, but you need to be thoughtful and sensible. I believe less is more and to keep it simple! If you can hold two color cards out with straight arms, separate them (not hold them right next to each other), and can’t tell a difference, you need to select one of them and terminate the other. Accent walls can be tricky to select, but if done right, they can add interest and excitement to a space with little additional money. I would suggest not to over think it and not to force it. If you want an accent wall, go back to my two rules of thumb: Is the wall symmetrical? and/or does it have an architectural detail you would like to highlight? I have literally told customers that they have NO good walls to accent. It’s okay. Use other types of décor in order to spice up the space! If you are looking to paint accent walls in Denver, and would like some assistance, please reach out to us, we would love to help.